Sweater weather is the best! Love your sweater!! Zara does it again! This really is the perfect Christmas green. I think I need to check it out! I cannot believe the red was stolen from your doorstep. That is just awful. Yay for getting through most of your shopping though! Seriously the best feeling in the world. Have a great week, Shauna! You pull this off so well! I love the lime green color! I’ve said it before and I’ll say it again, no one does brights like you do..so incredibly fun!! You are gorgeous! You should get the Arlo Camera system,, we had it installed and can see everything that happens on the front porch. You could’ve seen who stole it, at least to give video to the police, so so frustrating. I do hope your week is wonderful, peaceful and festive my beautiful friend! Your sweater is beautiful. The color is to die for. Ok I LOVE the color of this sweater! It’s so much fun and also looks super cozy! 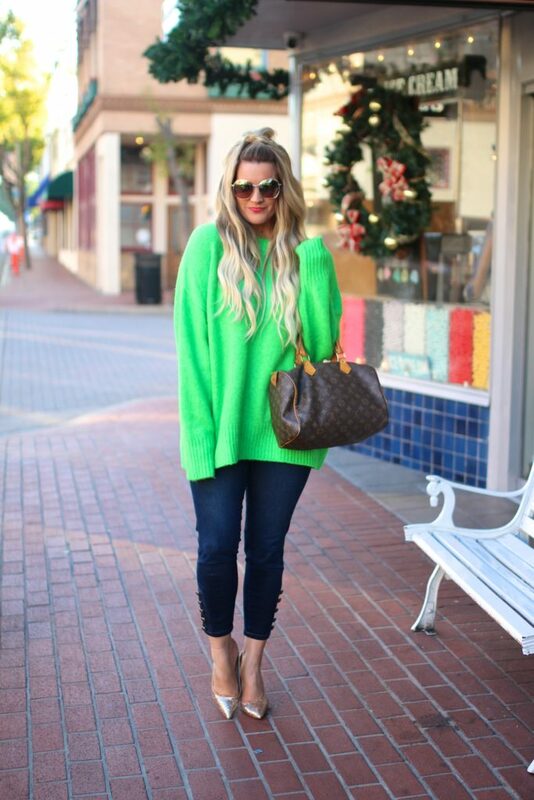 Give me all the oversized sweaters! How rude! I am so glad you got it thou–I love the bright green!! It makes me feel so cheerful!! Love the green and the detailing on your pants. Crazy about it being stolen. It’s sad that it seems to be happening more and more. I love the green and gold pairing! It’s perfect for the season and how cozy is that sweater! I have to find the perfect gift too or it stresses me out. My hardest is Blaire!! I am totally in love with this sweater! You look cozy and so chic with your sparkly heels, gorgeous! Green is such a fantastic seasonal color! I love this bright shade, a gorgeously eye-catching piece! So this sweater is so much fun! 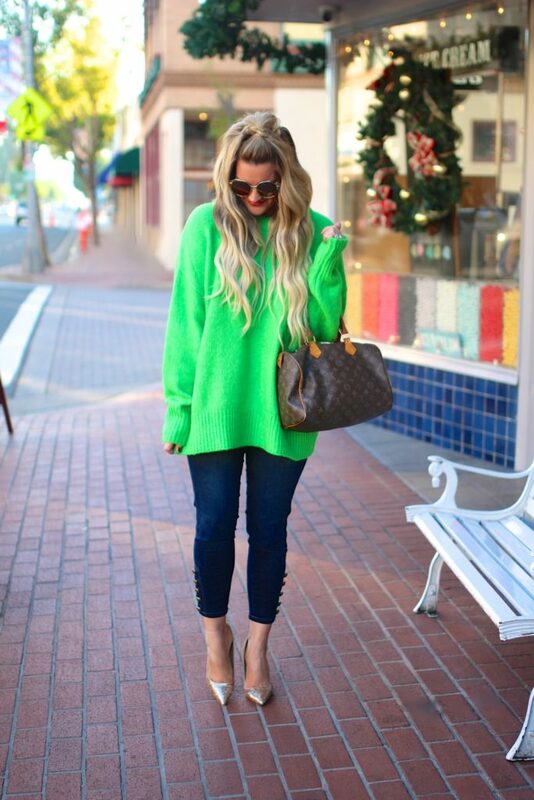 I love the neon green and those heels are just fabulous with the outfit! Love this cozy look. This oversize sweater looks perfect on you. I love that outfit. It looks so festive. This is such a fun sweater! Loving its festive/holiday vibe. 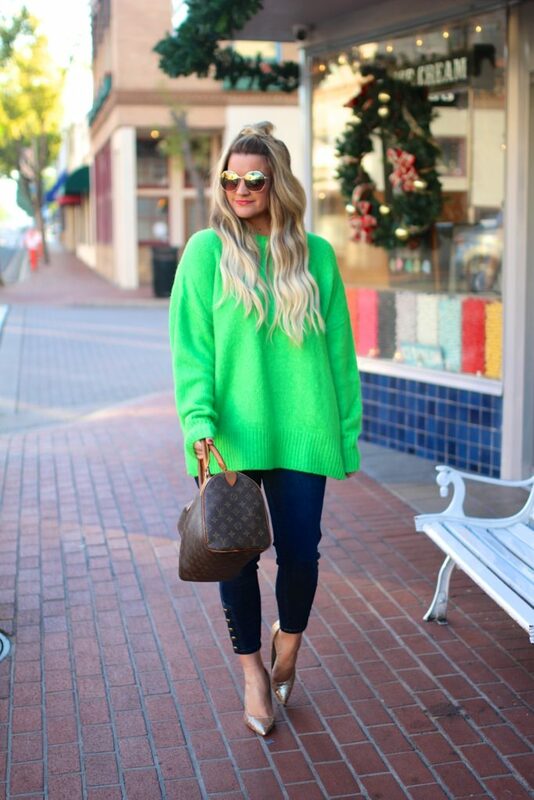 Ohhh, too fun- this is a great spin on that classic holiday green! Lovely look.Love the pop of color. The color of this sweater is like a dream <3 You look so so pretty sweetheart. I cannot believe they stole your package. Talk about a Christmas grinch. But I am glad you ordered this in two colors cause it is gorgeous. Love this vibrant Kelly green. So good with the gold glittery pumps! Welcome by Thursdays to link your fabulous style with me. I also think you’d like my last two style posts. Happy Hump Day!! This is the cutest and coziest sweater!! Love the festive green on you, so pretty! People are crazy! What the heck, you shouldnt have to worry about packages. Despite that, your bright green color looks so festive, and I love the button detail on your jeans!